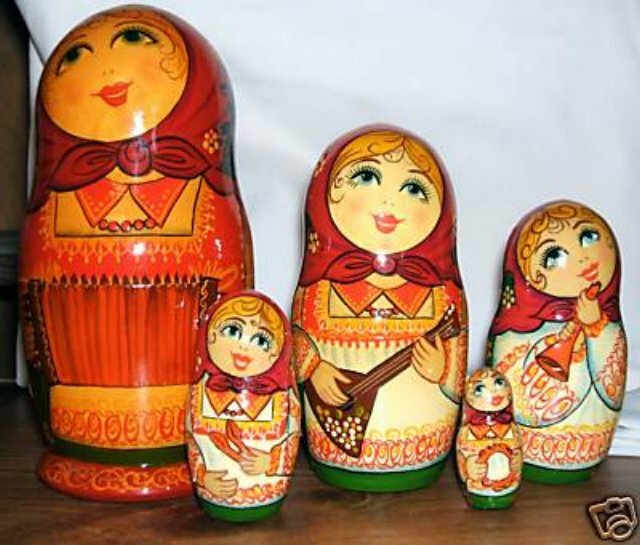 This is a set of 5 nesting dolls playing musical instruments: accordion, balalaika, flute, spoons and tambourine. The largest measures at 6 1/2 inches and the smallest at 2 inches. These dolls are dressed in dark red, orange and green. They have side glancing faces with curly blonde hair and large blue eyes. The largest doll is a bit darkened with age. Signed on the bottom by the artist.